In talking about emotional intelligence and maintaining emotional balance it only makes sense to talk about what those two things ultimately develop: emotional maturity. Often times, as a security measure, we built these walls up around our emotions to keep people away from them. Maybe it is guarding your heart after a breakup? Maybe it is something as simple as not allowing yourself to be hopeful in a situation for fear of disappointment. When you’ve reached a high level of emotional maturity, those heavy walls that we build to shut ourselves in begin to crumble. You’re not afraid to love because you know you can make it through a failed relationship if you have to. You can allow yourself to be hopeful, even in the face of possible disappointment because you know that life goes on. Compassion, to me, is a total lack of judgement. Being compassionate is having the ability to put aside your personal beliefs and biases to take care of the people around you. Let’s say you have a friend that repeatedly dated someone that you told them was bad for them. Eventually, the relationship falls apart (just like you told them it would), but instead of saying “I told you so” – you take their side and comfort them. One of the most important aspects of emotional maturity is being able to process an emotion before eliciting a reaction. Things like being instantly defensive or offended aren’t emotionally mature responses. Sure, sometimes things are blatantly offensive or disrespectful, but again, your reaction to them is what is the key. For instance, let’s say someone you don’t like makes a snarky comment meant to offend you. Instead of screaming or head-butting them like you might want to, shrug the comment off and make them feel stupid for trying to be petty. I don’t care how much someone says that they are unbiased, we all have our own discrete opinions. Whether it is a moral bias, a social bias, or a bias based on experience – they exist for a reason. Awareness is the key to accepting your biases and not letting them affect the outcome of a situation based on how you feel about something. Experience is the best teacher that we have in our lives, so to totally throw out your instincts that you’ve developed over time is a waste of that experience. Letting them rule who you are and how you approach situations in life is just as much of a waste. No one is perfect. How many times have you heard that? We are bound to make a mistake at some point, and instead of beating yourself up about it – learn from it. Accept that the mistake was made, acknowledge what caused the mistake, and actively prevent it from happening again. This doesn’t just pertain to some task at work, it applies to our interactions with people as well. 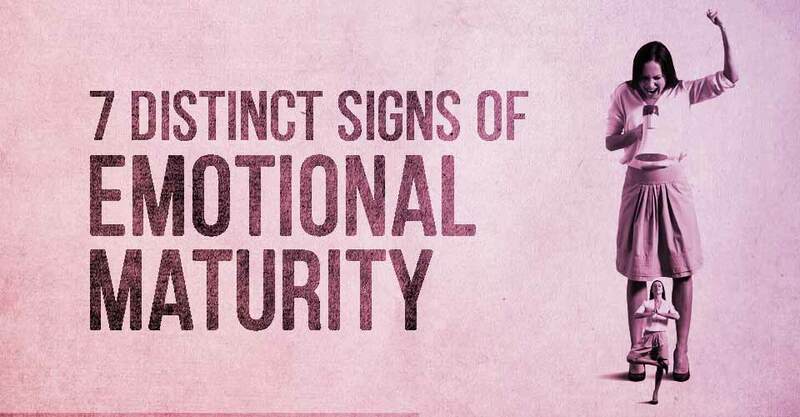 The MOST important aspect of emotional maturity is knowing when too much is too much. There are going to be times in life that no matter how well we control and balance our emotions, they are going to get to us. Again, it is in our nature. How and when we ask for help is a huge indicator of our personal level of emotional maturity. Waiting until you are falling apart at the seams to make a vague facebook posting is about as effective as crying to your best friend every time someone looks at you funny. Finally, we all need to understand when a situation is hopeless. I personally hate quitting anything, but there are going to be things and people in our lives that we just need to walk away from. No amount of love, work, or passion can fix certain situations in our lives. We simply need to know when to walk away. Walking away without even trying is just as bad as staying too long, though. There is a balance and it is one that only comes from learning from experience.